BlackwaterBLUE from monkster.com: Blues set to lose Lukaku in January? 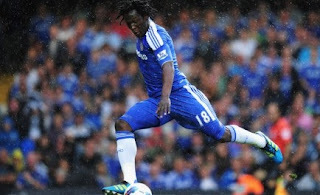 Blues set to lose Lukaku in January? Cash-rich Spanish club Malaga is reportedly preparing a January offer to get hold of Chelsea’s young Belgian sensation Romelu Lukaku on-loan until the season ends. The Blues, who signed the 18-year-old Belgian young-gun from Anderlecht last season for £18 million, have struggled to make way for the player in the first team with the likes of Dider Drogba, Nicolas Anelka, Fernando Torres and Salomon Kalou around. The Spanish club is said to want to boost its forward line and are keen to get the youngster on-loan for the remaining season. This will also help Lukaku gain experience and could also help him to become a regular in the Chelsea first team next season. Malaga will remain hopeful to secure the youngster’s signature this January.